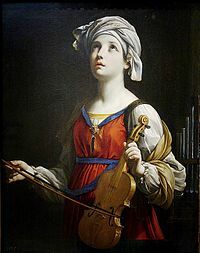 Today is the feast day of St. Cecilia, who happens to be the incredible saint I chose for my Confirmation in eighth grade to be the saint I would imitate and who would be my guide and leader to our one, true, and loving God...a.k.a. my heroine. :) So, because of her day and her awesomeness, she deserves a special, it's-not-Saturday blog post. There are so many words I could type to describe this holy woman but I'll stick to the stories that pluck my heart strings and that glorify our Lord, proving His powerful presence and undying love for us. Cecilia was married to a man named Valerian, an arranged marriage, but vowed to remain a virgin. On their wedding night she revealed this vow to her new husband and also told him that an angel of God in her presence, guarded her virginity and would let no one touch her. She told Valerian that if he were to believe in the Lord and be baptized, he too would see the angel that guarded her. He did and upon returning from his baptism, he saw Cecilia praying in her chamber, beside her an angel with flaming wings who placed two crowns of roses and lilies upon each of their heads. Can you imagine? Sometimes I wish God would allow us all to see the angels that roam this earth so that everyone would believe, but I know that we would either pass out or die just looking at their beauty. And, what's the value of faith if everything is handed to you on a silver platter, right? So anyway, on to the sad and a little gory, but glorious part of her life...her death. 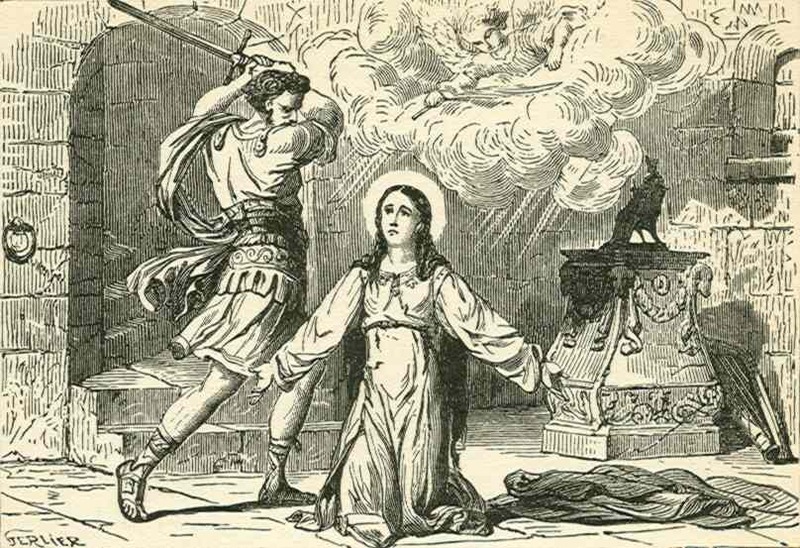 Because of her outward love for God in a time when religion was persecuted, Saint Cecilia was condemned to die, first by enduring extreme heat and thereby, suffocation. By the grace of God, and I mean by the grace of God (oh my gosh! ), it had no effect on her - she didn't even SWEAT! Seeing the ineffectiveness of her "death sentence", an executioner was sent in to sever her head. After three blows, he gave up trying. He had succeeded in severing her head partially but she still lived for three days, preaching and praying to God. After the three days were over and her death came to pass, those around her knew she must be in heaven. It was around the year 177 A.D.
Now my fave part...in the year 1599, her body was exhumed and found incorrupt - meaning it did not show signs of decomposition! If that's not proof of a working, magnificent God, I don't know what is?! Things like this don't just happen! 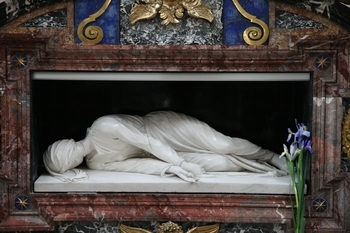 Presently, Saint Cecilia is buried in a church built in her honor in Rome. I have in this marble expressed for you the same saint in the very same posture. Her story takes my breath away every time I hear it and causes me to love God with a renewed fervor, counting on his unending mercy and hoping to one day be in the His presence and that of all of His saints. To read more about Saint Cecilia, click here and/or here. To read more on what the big deal about consecrated virginity is and why it's special, click here and/or here. I love her!! Great post! !